Linen is a textile made from the fibers of the flax plant, Linum usitatissimum L., which is a delicate and graceful annual that stands about 3 feet high and produces attractive blue flowers. Its Latin name means “most useful,” and for good reason. 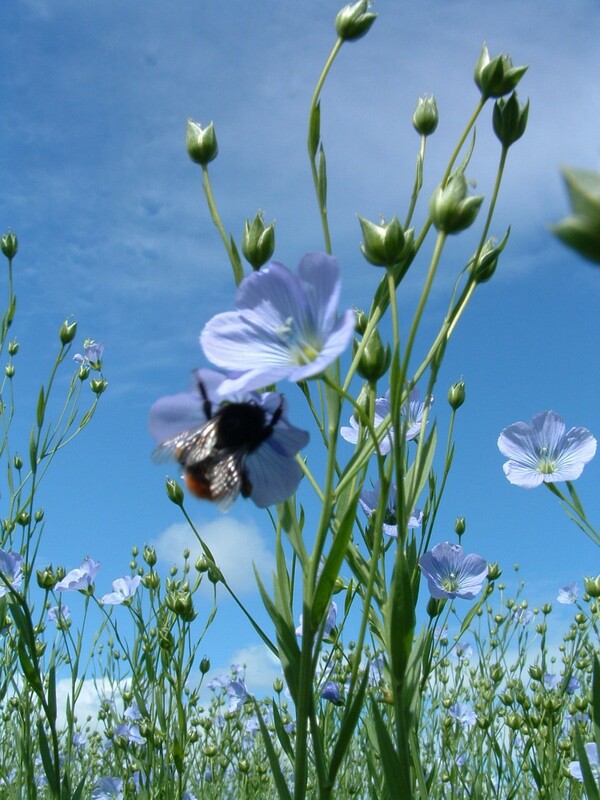 Though technically a wildflower, flax has been cultivated for thousands of years for a wide variety of important uses. Common flax was one of the earliest domesticated plants. A cousin of hemp, cannabis sativa L., flax is also known as a “bast” plant, meaning the fiber is collected from the inner bark, or bast, of the steam. Flax grows best at northern temperate latitudes, in cool, humid climates and within moist, well-plowed soil. Today, France, Belgium, Netherlands, Spain, Russia, Egypt and China are the foremost producers of flax for commercial textile purposes. China is also a major buyer of raw flax for processing, with imports of 60 000 tons a year, including most of Europe’s flax fibers. Bulk linen production has shifted to Eastern Europe and China, but niche producers in Ireland, Italy and Belgium continue to supply the market for high quality fabrics in Europe, Japan and the USA. There are two main types of flax grown worldwide: fiber flax and seed flax. Flax is one of the oldest fiber crops in the world. It was used by the ancient Egyptians, Romans, Greeks and Hebrews for food, clothing and medicine. The use of flax fiber in the manufacturing of cloth in northern Europe dates back to Neolithic times. In North America, flax was introduced by the Puritans, and today has become an essential commercial crop grown throughout the Midwest. Today, flax is used to make linen cloth, and it’s usually an expensive textile, produced in relatively small quantities. Linen fabric maintains a strong traditional niche among high quality household textiles – bed linen, furnishing fabrics, and interior decoration accessories. More than 70% of linen goes to clothing manufacture, where it is valued for its exceptional coolness in hot weather – the legendary linen suit is a symbol of breezy summer elegance. Linen has a long staple (i.e., individual fiber length). The best grades of flax are used for fine fabrics such as damasks, lace and sheeting. Shorter flax fibers produce heavier yarns suitable for kitchen towels, sails, tents and canvas. Lower fiber grades are used as reinforcement and filler in thermoplastic composites and resins used in automotive interior substrates, twine, rope, furniture and other consumer products. Flax fiber is also a raw material for the high-quality paper industry for the use of printed banknotes and rolling paper for cigarettes and tea bags. Linen fabric is one of the preferred traditional supports for artists canvas. In the United States cotton is popularly used instead because linen is many times more expensive, restricting its use to professional painters. In Europe however, linen is usually the only fabric support available in art shops. Linen is preferred to cotton for its strength, durability and archival integrity. Flax seed is grown for human and animal consumption. 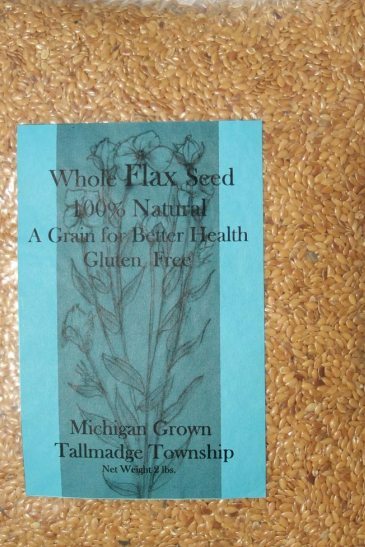 Flax seeds can be eaten raw or cooked, cracked or whole, and can be ground into flour. They are often sprinkled on top of bread, cooked into foods like chips, muffins and cakes or added to granola cereal. Flax seeds contain high amounts of Omega-3, 6 and 9 fatty acids, which are believed to reduce cholesterol, boost the immune system and lower the risk of heart disease. They also contain potassium, magnesium, fiber and protein, and make a good natural laxative. Flax seed oil (also called linseed oil) is used for culinary as well as industrial purposes. A good source of essential omega-3 fatty acids, the oil is believed to provide benefits to arthritis and lupus patients by reducing inflammation. For industry, it serves as a pigment binder for oil paint and a drying agent for paints, lacquers and inks. It is sometimes used as a wood finish, in varnishes, printing inks, and soaps and can be combined with cork to make linoleum. Once oil is cold pressed from flax seeds, the husks, which are high in protein, are often used as feed for chickens and other livestock. The seeds provide animals with much needed fiber and protein. Eggs from chickens that were fed flax seeds are purported to be high in omega fatty acids and have added health benefits. Flax fibers range in length up to 90 cm, and average 12 to 16 microns in diameter. They are not as long as hemp, which has fibers that measure from 90 cm to 460 cm, yet they are much longer than cotton fibers, which measure only as much as 3.5 cm. There are three degrees in the ripening of the flax grown to make linen: green, yellow and brown. The yellow has proved to be the most suitable for fiber production. Flax that is pulled too early – green – produces very fine but weak fibers. On the other hand, in overripe flax – brown – the stems are strong but brittle and produce too high a proportion of undesirable short fibers (‘tow’). When the flax is yellow, the fibers are long and supple, and therefore ideal for further processing. (This is where we get the term “flaxen” to describe a yellow haired person.) The plant must be harvested as soon as it appears ready since any delay results in linen without the prized luster. It is important that the stalk not be cut in the harvesting process but removed from the ground intact; if the stalk is cut the sap is lost, and this affects the quality of the linen. These plants are often pulled out of the ground by hand, grasped just under the seed heads and gently tugged. The tapered ends of the stalk must be preserved so that a smooth yarn may be spun. The stalks are tied in bundles (called beets) and are ready for extraction of the flax fiber in the stalk. However, fairly efficient machines can pull the plants from the ground as well. Retting may be accomplished in a variety of ways. In some parts of the world, linen is still retted by hand, using moisture to rot away the bark. The stalks are spread on dewy slopes, submerged in stagnant pools of water, or placed in running streams. Workers must wait for the water to begin rotting or fermenting the stem—sometimes more than a week or two. However, most manufacturers today use chemicals for retting. The plants are placed in a solution either of alkali or oxalic acid, then pressurized and boiled. This method is easy to monitor and rather quick, although some believe that chemical retting adversely affects the color and strength of the fiber and hand retting produces the finest linen. Vat or mechanical retting requires that the stalks be submerged in vats of warm water, hastening the decomposition of the stem. The flax is then removed from the vats and passed between rollers to crush the bark as clean water flushes away the pectin and other impurities. If flax is not fully retted, the stalk of the plant cannot be separated from the fiber without injuring the delicate fiber. Thus, retting has to be carefully executed. Too little retting, or under retting, may not permit the fiber to be separated from the stalk with ease; it produces a coarse yarn suitable only for ropes. Too much retting (over retting or rotting) will weaken fibers so they will have limited application. The value of a batch can vary by 100% depending on the quality of the retting. After the retting process, the flax plants are squeezed and allowed to dry out before they undergo the process called breaking. In order to crush the decomposed stalks, they are sent through fluted rollers which break up the stem and separate the exterior fibers from the bast that will be used to make linen. This process breaks the stalk into small pieces of bark called shives. Then, the shives are scutched. The scutching machine removes the broken shives with rotating paddles, finally releasing the flax fiber from stalk. The fibers are now combed and straightened in preparation for spinning. This separates the short fibers (called tow and used for making more coarse, sturdy goods) from the longer and more luxurious linen fibers. The very finest flax fibers are called line or dressed flax, and the fibers may be anywhere from 12-20 in (30.5-51 cm) in length, but first class fibers are at least 60 cm. Color of light grey, steel grey and silver grey are considered the best. Line fibers (long linen fibers) are put through machines called spreaders, which combine fibers of the same length, laying the fibers parallel so that the ends overlap, creating a sliver. The sliver passes through a set of rollers, making a roving which is ready to spin. The linen rovings, resembling tresses of blonde hair, are put on a spinning frame and drawn out into thread and ultimately wound on bobbins or spools. Many such spools are filled on a spinning frame at the same time. The fibers are formed into a continuous ribbon by being pressed between rollers and combed over fine pins. This operation constantly pulls and elongates the ribbon-like linen until it is given its final twist for strength and wound on the bobbin. While linen is a strong fiber, it is rather inelastic. Thus, the atmosphere within the spinning factory must be both humid and warm in order to render the fiber easier to work into yarn. In this hot, humid factory the linen is wet spun in which the roving is run through a hot water bath in order to bind the fibers together thus creating a fine yarn. Dry spinning does not use moisture for spinning. This produces rough, uneven yarns that are used for making inexpensive twines or coarse yarns. These moist yarns are transferred from bobbins on the spinning frame to large take-up reels. These linen reels are taken to dryers, and when the yarn is dry, it is wound onto bobbins for weaving or wound into yarn spools of varying weight. The yarn now awaits transport to the loom for weaving into fabrics, toweling, or for use as twine or rope. A great concern to the environment is the chemicals used in retting. These chemicals must be neutralized before being released into water supplies. The stalks, leaves, seed pods, etc. are natural organic materials and are not hazardous unless impregnated with much of the chemicals left behind in the retting process. The only other concern with the processing of linen is the smell—it is said that hand-retted linen produces quite a stench and is most unpleasant to experience. The first flax-spinning mill was opened in England in 1787, but only in 1812 was linen successfully woven with power looms. The linen industry suffered in relation to cotton because many textile inventions were not applicable to linen. Although linen exceeds cotton in coolness, luster, strength, and length of fiber, the expense of production limits its use. The decrease in use of linen may be attributed to the increasing quality of synthetic fibers, and a decreasing appreciation of buyers for very high quality yarn and fabric. Very little top-quality linen is produced now, and most is used in low volume applications like hand weaving and as an art material. Over 90% of the world’s spinning equipment are designed to quickly and effectively spin fibers based on the length and diameter of cotton fibers. This is referred to as the “cotton” system. No other spinning system is as productive or cost-effective as the cotton system. Flax fibers can be broken down into their shortest components, and this is called cottonization and the product is called cottonized flax. Flax has traditionally been cottonized using mechanical systems (i.e., mechanical cottonization) but it can also be done using enzymes, steam explosion and ultra-sound. This “cottonization” is done to be able to spin linen fibers on cotton machines – it means the process is quicker and requires less equipment. However, the finished fibers often lose the characteristic linen look. The Living Linen Project was set up in 1995 as an Oral Archive of the knowledge of the Irish linen industry still available within a nucleus of people who were formerly working in the industry in Ulster. There is a long history of linen in Ireland. Linen is among the strongest of the vegetable fibers, with 2 to 3 times the strength of cotton. It is a very durable, strong fabric, and one of the few that are stronger wet than dry. It is smooth, making the finished fabric lint free, and gets softer the more it is washed. The fibers are resistant to damage from abrasion. However, constant creasing in the same place in sharp folds will tend to break the linen threads. This wear can show up in collars, hems, and any area that is iron creased during laundering. Linen has poor elasticity and does not spring back readily, explaining why it wrinkles so easily. Linen fabrics have a high natural luster; their natural color ranges between shades of ivory, ecru, tan, or grey. Pure white linen is created by heavy bleaching. Linen typically has a thick and thin character with a crisp and textured feel to it, but it can range from stiff and rough, to soft and smooth. 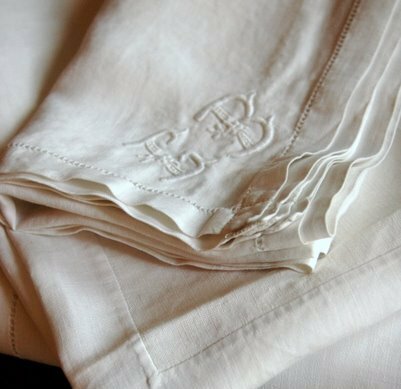 When freed from impurities, linen is highly absorbent and will quickly remove perspiration from the skin. Linen is a stiff fabric and is less likely to cling to the skin; when it billows away, it tends to dry out and become cool so that the skin is being continually touched by a cool surface. It’s valued for its exceptional coolness and freshness in hot weather. Mildew, perspiration, and bleach can also damage the fabric, but it is resistant to moths and carpet beetles. Linen is relatively easy to take care of, since it resists dirt and stains, has no lint or pilling tendency, and can be dry cleaned, machine washed or steamed. It can withstand high temperatures, and has only moderate initial shrinkage. Linen should not be dried too much by tumble drying: it is much easier to iron when damp. Linen wrinkles very easily, and so some more formal linen garments require ironing often, in order to maintain perfect smoothness. Nevertheless the tendency to wrinkle is often considered part of the fabric’s particular “charm”, and a lot of modern linen garments are designed to be air dried on a good hanger and worn without the necessity of ironing. A characteristic often associated with contemporary linen yarn is the presence of “slubs”, or small knots which occur randomly along its length. In the past, these slubs were considered defects associated with low quality. The finest linen had very consistent diameter threads, with no slubs. Today, however, the presence of slubs is considered appealing, and fashion dictates that even the finest linens have these slubs.